After her husbands death, Heidi Chase refuses to take off her rings and swears another man will never steal her heart. She is extremely faithful and while her friends think it's virtue binding her to the past, it's really fear. Patrick Wheldon never intended to give his heart to Heidi. Not until her vows to her previous husband were no longer standing between them. But he did and the relationship between them quickly changes into a battle he’s not sure he has the strength to fight. Follow Heidi and Patrick as they question the definition of soul-mates and discover the true meaning of love. But what is love if the heart falls for someone else? Does true love stay faithful even after death? "You are the only person who can answer these questions yourself." Like the first two books, The Life I Now Live gives me a lot to think about and it gave me a lot of other perspectives on the things I was already thinking about. What I like most in this series, and in this book, is that it's like my mind has been put into a book. A lot of things I've been wondering about has been showing up in this series, and now I can't wait to see what the next book's questions will be. I love Heidi's personality. I love her when she realizes that she really isn't that strong woman her friends seem to think she is, and that she's just living her complicated life one day at a time. What I love the most about her is that promises are so important to her and she strives to hang on to her words and do what she promised to do even though she's on the verge of being hurt. I can't decide how I feel about Patrick, though I like how he does what he thinks Heidi needed. Sometimes, though, he seems 'girly'. That's the reason I'm rating this only four stars. But I like how faithful he is, and how caring. 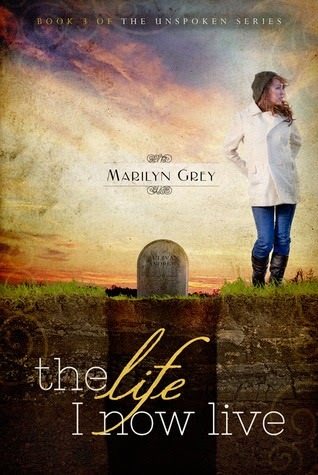 Marilyn Grey's twists are very interesting, and I like how she surprises her readers. I like how she throws in other characters and give a glimpse and builds anticipation on what the next book will be.